Protests erupt at main intersections across Israel against land swaps, negotiations with Palestinian Authority. 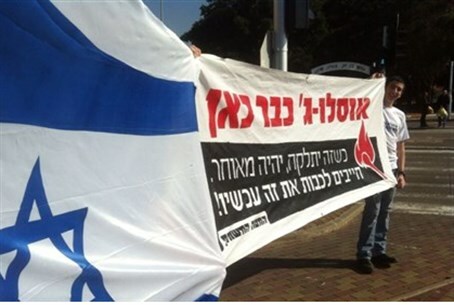 The nationalist group the Common Front for Governmental Change (Hebrew: HaMateh HaMeshutaf) protested across Israel Friday over the ongoing negotiations between Israel and the Palestinian Authority (PA), and the danger those negotiations present to Jewish communities in Judea and Samaria. At some of the protests - particularly the one at a major intersection in Tel Aviv - activists met with representatives from the extreme left-wing group Peace Now. "It is inconceivable that an extreme minority dominates the political discourse," the protestors told Peace Now representatives. Menahem Ben-Porat, a yeshiva (Torah academy) student protesting with the group in Akko, told Arutz Sheva that bystanders seemed to support the protest. "A lot of people are driving by and honking, and people asked how they could help us," he stated. Tens also protested at the Tzabar intersection in the Krayot, a cluster of cities near Haifa. "A dangerous political situation is ahead of us," one protester stated. "All of us - youth from the Beitar, Bnei Akiva, Ezra, and Ariel youth groups - went out [today] to protest against the negotiations." Benny Katzover, Chairman of the Samaria (Shomron) Residents’ Committee, said that Justice Minister Tzipi Livni and PA Chairman Mahmoud Abbas were working "behind closed doors" to ensure the acceptance of an agreement which would endanger the State of Israel. "We will work in every way possible to prevent the signing of this agreement - or any other - which compromises Israel's security or future Jewish communities," Katzover declared. The protest follows unconfirmed reports alleging that Prime Minister Binyamin Netanyahu supports a population and land swap plan, which would see Israeli Arabs pushed into the "triangle" region in exchange for the right to keep the rest of Judea and Samaria.